Rotork Gears has introduced the IB AWWA series of bevel gearboxes, designed specifically for the manual operation of AWWA standard C560 cast iron and C561 fabricated stainless steel gate valves. The AWWA (American Water Works Association) is responsible for setting standards on the design, performance and manufacturing of valves and associated equipment. With over 50,000 members, it is the world’s largest scientific and educational association dedicated to managing and treating water. Developed from the successful and rugged Rotork IB multi-turn gearbox range, the AWWA series feature a fully sealed cast or SG iron enclosure that is grease filled for life and certified as watertight to IP68 as standard. Precision engineered input pinion and output bevel gears with low friction hub bearings provide an extended service life and smooth operation under high load conditions. Output flanges, to MSS SP-102 or equivalent ISO and DIN standard dimensions, feature a removable output sleeve to facilitate easy valve adaption. The standard operating temperature range is -40º to +250ºF (-40 to +121ºC), with other temperature ranges available on request. Further options include auxiliary spur, bevel or two-speed input drive reducers, a mechanical dial position indicator and flexible extensions. In addition, two or three input shafts at 90º and 180º to each other can be fitted. The range of gearbox sizes delivers an output torque range of 280-8,000 lbf.ft (380-10,850 Nm). All models are available with suitably sized handwheels for manual operation. 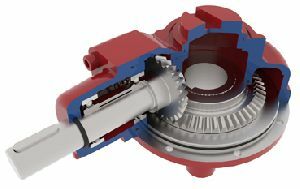 Find out more about the IB AWWA series of bevel gearboxes.